Let’s start with Kevin Smith. Scifi hubby is a huge fan of Kevin Smith. He loves his movies but more than that he is addicted to his podcasts. To give both of them some credit some of the podcasts are actually quite entertaining. The only catch is that there seems to be a new podcast every day and Scifi hubby hasn’t yet worked out how to pause them so once he presses ‘play’ I’m glared at for speaking/breathing. Anyone who knows me can tell you that shutting me up for two minutes let alone two hours takes a miracle and making Scifi baby be quiet for that long is quite simply impossible. So Scifi hubby is mostly resigned to listening late at night or on long car journeys. Kevin Smith announced that he was doing a few live shows in the UK recently and several of Scifi hubby’s friends managed to get tickets to the shows. Scifi hubby wandered round like a green eyed monster for a few days as we couldn’t go back to the UK for any of the shows. Meanwhile… One Saturday morning I was checking the George R. Martin website to find out when he is finally going to publish the last book in the Game of Thrones series. (No, I’m not watching the TV show. I’ve loved the books for years and want to know the ending. I’m pissed off with the TV show as it’s delayed publication and is now, allegedly, changing the end to suit the TV. Don’t get me started…) There’s no answer on a publication date but the site mentions that he is going to be at the Neuchatel International Fantastic Film Festival (NIFFF). Neuchatel is very close to where we live and possibly the least likely town to host a huge Scifi film festival but apparently it does. I found their website and realised that the two week long festival actually started that day but the dates for George R. Martin clashed with us going to the UK for London Film and Comic Con so there was no way I could meet him and throw tomatoes at him until he gave us a publication date. 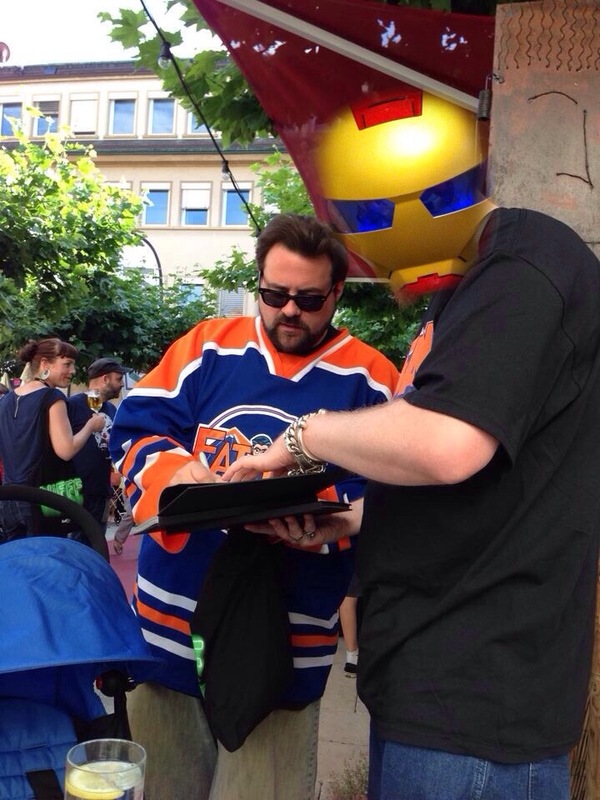 However I also spotted that strangely Kevin Smith was going to be a guest of honor at the Festival too! I mentioned this to Scifi hubby who refused to get excited and was very pessimistic about our chance of getting tickets, managing to see him etc. In the end I phoned the festival information line who told me that Kevin was speaking at the festival that afternoon, tickets were free and there were tickets available. I quickly ‘buy’ a ticket for Scifi hubby and, once I’ve peeled him off the ceiling, stuff him into the car along with Scifi baby and head into Neuchatel. We got to the cinema with an hour to kill so got a drink in the cafe/bar outside. Sometimes you really know that you are in Switzerland and this was definitely one of those moments. Sitting in the sunshine having a drink fifteen minutes before a world renowned director is due to give a ‘masterclass’ at an International film festival and there was no queue. A few other people were clearly having a drink and waiting too but in the UK/USA this would have been sold out with a two hour queue to get in to the venue not a civilized glass of wine. Also the ‘guest’ would have been smuggled into the building through a back entrance. So we were more than a little surprised when Kevin and his wife just wandered up the path behind Scifi hubby. Scifi hubby jumped up like a teenage girl at a music concert and asked Kevin if he would sign a couple of books he had brought with him that Kevin had written. Well, that’s what he tried to do. What came out was more high pitched, squeaky and breathless than he expected. He ended up babbling away about how Kevin was one of his heroes and he hadn’t been this excited to meet someone since he met Adam West. Luckily Kevin was very nice, signed his books and even took a selfie with him. Scifi hubby went in to see the masterclass and Scifi baby and I went for a walk and ice cream. The end of the story? No. We went back to meet him an hour later and were a little early so Scifi baby and I got chatting to his wife who was lovely. I still can’t believe she doesn’t kill Kevin for some of the things he says about their relationship on the podcasts. Scifi hubby came out of the cinema bouncing up and down as he had asked a question during the Q&A session. Kevin had said on that week’s podcast that he been invited to visit the Star Wars set whilst he was in England so Scifi hubby showed off his true geek credentials, proved he listens to the podcast and asked what it was like to go on the Millenium Falcon. What’s more the whole event was being recorded and can be found here (Scifi hubby is around 33mins in). So Scifi hubby ‘beat’ his friends. Not only did he get to listen to Kevin Smith but he also met him and got to ask a question. If he gets any more smug we may need to evacuate the area. 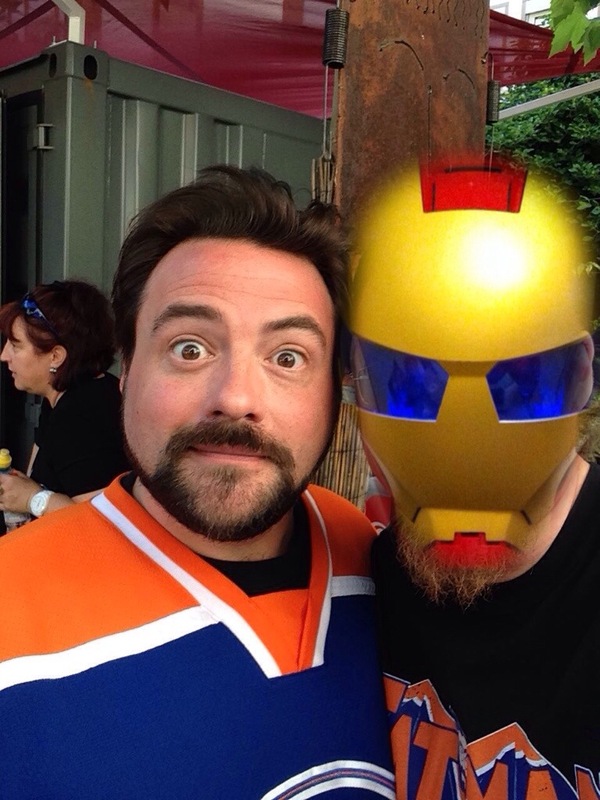 My only concern is that Scifi hubby is starting to model his ‘fashion’ sense on Kevin Smith – really not a good idea.